Loosely based on his real life, 2 States: The Story Of My Marriage charts the love story between a Tamil Brahmin girl and a Punjabi boy who find their relationship jeopardized by this very ethnic disconnectKrish Malhotra meets Ananya Swaminathan at IIM Ahmedabad where they are both pursuing an M.B.A. Ananya s charm and good looks bring her to the fore of the popularity chart at the Institute and although Krish finds her very appealing, this reputation makes him wary of her. Ananya enlists Krish s help who is an IIT graduate and the duo began their friendship. Soon this friendship blossoms into love and the pair become inseparable. The real story begins in their last year at the Institute when having moved past all of the other person s idiosyncrasies, the two are resolved to tie their love through the bond of marriage. However, they aren t the only ones involved in this decision and although they are in love, there is the question of their families. With the parents not accepting their love, Ananya is sent off to meet Tamil Brahmin boys while Krish is sent off to meet respectable Punjabi girls. However, Krish cannot forget Ananya and is the same with her and he embarks on a quest to win over her family to finally marry her. Through a number of amusing and misfortunate clashes, the families disapprove of this union due to their cultural and ethnic differences. The magic that is Bhagat s gift in storytelling is his use of humor and candor and he employs these devices to full use in this story where the North-South polarities provide generous comedic effect. 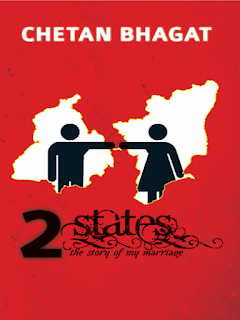 Narrated from Krish s point of view, a first person narrative, 2 States: The Story Of My Marriage is an infectiously lighthearted read that digs at the ethnic gap between Indian communities. The rights of the book have been sold to producer Nadiadwala who is adapting the warm tale for the big screen.